There's an enormous break up the road: 17 guys, including representatives from 14 teams. Discovery has placed Savoldelli and Rubiera, T-Mobile has Oscar Sevilla, CSC has Kurt-Asle Arvesen. Bouyges Telecom's French national champion Pierrick Fedrigo is there as well, leading by 20 minutes plus. With 2 riders up front, it's possible that Discovery will take back the team competition lead from T-Mobile, where they trail by just under 20 minutes. The leading 17 has split in two: Paolo Savoldelli, Oscar Sevilla, Kurt-Asle Arvesen, Bram Tankink, Sebastien Hinault, Daniele Righi and Andrey Grivko, and Simon Gerrans have made the front group, while Erik Dekker, Rubiera, Allan Davis, Dario Cioni, Stephane Auge, Pierrick Fedrigo, Carlos Da Cruz, Samuel Dumoulin, and Thomas Lovkvist are about a minute back. The peloton is 22 minutes plus behind the Sevilla group. Finally, with 20 or so kilometers to ride, T-Mobile has come to the front to defend their team lead. The gap between the two lead groups is up to around 2:30. At 10 km, the 8 leaders have 2:49 on the chase group and more than 24 minutes on the peloton. On the day's last climb, Savoldelli and Hinault get a 10-second gap on the lead group. Gerrens and Arvesen try to bridge, and chase for about 4 kilometers. As they close, Savoldelli attacks Hinault, but it's short-lived and the four ride together with less than 2km to ride. Now Arvesen attacks! He's gone with 1 k to go. Hinault and Savoldelli are chasing, winding up the sprint with under 500 meters to ride, they're to Arvesen, and Savoldelli comes around and takes the stage! On the final 3rd-Category climb, Vinokourov launches an attack! He's split the peloton in half, and yesterday's big winner, Cadel Evans is in a group off the back, with Christophe Moreau and Floyd Landis. They're almost 15 seconds back. Evans is working at the front of the dropped group, but it looks like the gap will hold. Armstrong's group of just 10 men comes in at 22:28, with Popovych, Leipheimer, Ullrich, Rasmussen, Basso, and Mancebo. Then, 20 seconds back, comes a group containing Evans, Christophe Moreau, and Floyd Landis. Vinokourov climbs up to 7th overall, as Landis slides to 9th. I found myself wanting Discovery Channel to chase Vinokourov down Wednesday: they still had 5 or 6 strong guys on the Galibier, and I think they could have closed a 2 minute gap. Glancing through Bob Martin's Stage 11 summary, though, they clearly did exactly the right thing. Just four guys made time on Armstong Wednesday: Vinokourov got 1:45, Botero 1:32; Christophe Moreau got 8 seconds; José Azevedo got 2 seconds. Botero and Vinokourov are potentially dangerous guys, but their damage was contained, and the rest of the field has lost one more day's opportunity to put Lance Armstrong under a hammer. Armstrong's retirement is now 10 stages and 11 days away. It's clear Iban Mayo, Roberto Heras, or Brad McGee won't be knocking Armstrong off the podium; Heras lost another 17 minutes, Mayo 22:35, and McGee almost 40 minutes. The performances of Heras and Beloki have led Liberty Seguros to reportedly make Jorg Jaksche the team captain for the rest of the Tour. Today, Discovery will mostly work to keep GC contenders out of any successful break: If Basso tries to go off, they'll chase. On the other hand, there are so many riders facing disappointing Tours, and lowly placed, that it shouldn't be hard to find a quality break and let it go. 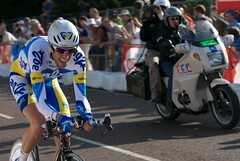 Especially after Vinokourov's break succeeded Wednesday. T-Mobile's Alexandre Vinokourov takes Stage 11 with a tremendous day-long breakaway. Spending much of the break with former teammate Santiago Botero, Vinokourov repaired some of the damage done to his GC hopes in Tuesday's Stage 10. The stage victory is the first for T-Mobile, whose director said Tuesday night that the team "are just not any good." Christophe Moreau moved up into 3rd place in the overall with a sprint for the finish line bonus points. Bobby Julich finished 4th on the day. Botero moves up into 6th for his day-long efforts, and Vinokourov moves into 12th, at 4:47. Overall race leader Lance Armstrong lost a little more than a minute to Botero and Vinokourov, but further roasted a number of former GC hopefuls. The autobus topped the Galibier just after the leading group finished the stage. 5) Eddy Mazzoleni, Lampre-Caffita, s.t. 6) Lance Armstrong, Discovery Channel, s.t. Over the top of the Galibier, it was Vinokourov, then Botero at :41, Rasmussen at 2:23, with Moreau leading the field over at 2:40. Rasmussen has come back to Armstrong! He was just making sure he got max king of the mountains points. Botero has caught Vinokourov. He's clearly a faster descender, but now Vinokourov can use Botero as a guide for the rest of the descent, so they'll likely stay together. Armstrong and the Discovery men are flying down the hill; the gap has shrunk only to 2:24 with 20 kilometers to go. At 15 kilometers to go, it's 2:16. Vinokourov's transponder has come loose and is flapping around his dropouts. In a bit of mechanic magic, a team mechanic comes alongside in a car and snips the zip-ties holding it on, keeping all his fingers in the process. That may cost the escapees a few seconds. At 5 kilometers to go, the gap is down to 1:40. The leaders are inside the last 3 kilometers. Botero could easily sit in, since Vinokourov has the most to gain, but they're both taking strong pulls. I don't think we'll see any games in the last kilometer. Vino is sitting on Botero's wheel. They're shadowing each other, there goes Vinokourov, and Botero grabs his wheel, but he doesn't have the juice. It's Vinokourov taking the win, and a 20 second time bonus. Discovery is finishing in a team time trial. Azevedo falls off, Savoldelli falls off, third place is still up for grabs with a time bonus. Armstrong is contesting it, and Christophe Moreau takes the sprint! Armstrong is in a group of five, but now he's upped the tempo again! Basso is off the back! Only Rabobank's King of the Mountains, Michael Rasmussen, and the two Illes Balears riders, Valverde and Mancebo, can hold his wheel. Ullrich is about a minute down, and Voigt, this morning's yellow jersey is more than 10 minutes back. They've still got 5 miles to ride. The four are sharing work, with Rasmussen taking fewer pulls than the others. They're coming up on the 1k marker, and there's a steeper section. Rasmussen picks up the pace, but he's countered. Valverde was looking for it. Armstrong is just sitting in. 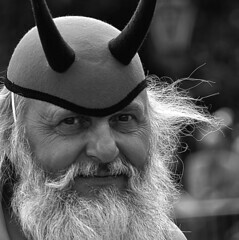 I don't think he'll beat Valverde in a sprint. There goes Armstrong from 500 meters! Armstrong sits up, and Valverde wins his first Tour de France stage! Now the former contenders come in: Basso at 1:00, Leipheimer at 1:12 or so. Landis, Evans, Moreau, Ullrich, Klöden: 2:15 to the line. Vinokourov and Julich: 5 minutes plus. Michael Rasmussen totally dominated Stage 9, cementing his lead in the Tour's King of the Mountains jersey, and moving high up in the General Classification. Jens Voigt, who spent the day chasing Rasmussen, pulls on the yellow jersey for his trouble, becoming the 2nd CSC rider in yellow this year (and ever), after David Zabriskie, who was forced to abandon today. Christophe Moreau of Credit Agricole, who was in Voigt's break, waved the French flag today: He's moved up to 2nd overall, and was 2nd on the stage. For Lance Armstrong and the Discovery Channel team, things returned to normalcy, as the team controlled the race pace on the biggest climb of the day after their miscue yesterday. T-Mobile had a very quiet day, with no attacks and nobody in the breakaway, after their aggressive moves in Stage 8. Stuart O'Grady took back some ground in the green jersey competition by staying with the heads of state all day and taking the field sprint for 4th on the stage. 5) Philippe Gilbert, Française des Jeux, s.t. 6) Antony Geslin, Bouyges Telecom, s.t. 7) Sebastian Lang, Gerolsteiner, s.t. 8) Laurent Brochard, Bouyges Telecom, s.t. 9) Jerome Pineau, Bouyges Telecom, s.t. 10) Gerrit Glomser, Lampre-Caffita, s.t. Who had 60 k in the Stage 9 Kirsipuu pool? Estonia's Jaan Kirsipuu, a four-time Tour stage winner who has started 12 Tours, has never made the race finish, and generally drops out early in the mountain stages. True to form, he's out of the race, leaving 177 riders contesting the stage. José Angel Gomez of Saunier Duval-Prodir has dropped out, after possibly breaking his collarbone in a feed zone crash. New polka-dot jersey Mickael Rasmussen rode out in a breakaway with fellow former mountain biker Dario Cioni of Liquigas-Bianchi. Rasmussen has taken max points over all the early 3rd Category climbs and the 2nd Category Grand Ballon. He's over Le Ballon d'Alsace, having led the field over every climb of the day. Behind Rasmussen and are CSC's Jens Voigt and CA's Christophe Moreau. They've dropped Angel Vicioso and passed Cioni. Fallen off Voigt, Moreau, and Vicioso's group are Tour of Switzerland winner Inigo Landaluze, Alexandre Moos of Phonak, and Xabier Zandio of Illes Balears. 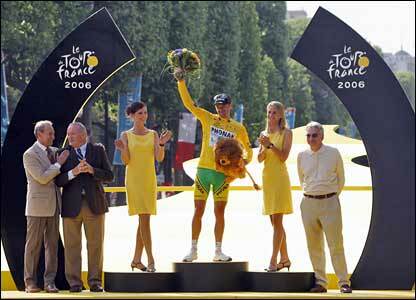 It looks likely that Armstrong will give up the yellow jersey tonight, but by how much and to whom? Either Rasmussen or Voigt could find himself in yellow tonight. Rasmussen will need 6 minutes on Voigt to take yellow, and over the top of the last climb, he had 4:20 in hand. Armstrong's group goes over 9:24 later. Armstrong is down to 5 teammates, including Savoldelli, Azevedo, Hincapie, Popovych and Rubiera. Advantage Voigt: Voigt and Moreau are taking some time back from Rasmussen. Armstrong's group is down to perhaps 50 riders. We'll see if anybody can get back on the back. Voigt takes some bonus time at an intermediate sprint, so he needs no more than 54 seconds at the end of the day to take the race lead. Didier Rous is involved in a crash back in the field. It looks like the 2-time French champion might have hit a road sign. Voigt flats -- the team car was right there, but he'll lose a little time, and it will disrupt Voigt and Moreau's chase of Rasmussen, which had been under 4 minutes. Armstrong's group now trails Rasmussen by about 8:30. Voigt is bringing time back on Rasmussen. Rasmussen takes the stage -- how far back to Voigt? It's a 3:03 gap to Moreau, then Voigt. 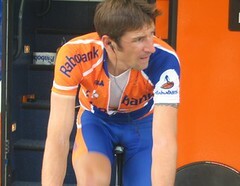 Rabobank takes two consecutive stages. Now we'll wait to see what Voigt's yellow jersey lead will be. Here come the big men, and, hello! It's Stuart O'Grady, who hung with the GC boys and will make some ground up in the green jersey competition with a 4th on the stage, with neither Hushovd nor Boonen anywhere to be seen. The gap to the Armstrong group is 6:04 -- Voigt will take off tomorrow with more than 2 minutes on Armstrong. Rasmussen is now in 4th on GC; he's somebody to keep an eye on. Robbie McEwen came in at 47:22, which is unlikely to get him disqualified. He popped a wheelie over the finish line. Lance Armstrong's bike failed the weigh-in by 180 grams. The team had to add some ballast before he took off. Coming soon, I'm sure, to a Trek commercial near you. Mikel Astarloza of AG2R was the early leader in 43:06, but now David Moncoutié drops the time to a 42:04. Santos Gonzalez of Phonak drops the time to 41:52, matched by Giuseppe Guerini of T-Mobile, about a half-second slower. Now José Azevedo sets a new mark with a 41:26! But then, here comes Ullrich in 40:42! Look above for more on Armstrong, who wins the day with a 39:41! Armstrong has caught Basso, his 2-minute man, and ridden by him! His last time check is 56 seconds faster than Ullrich. Looks like Armstrong will take his 3rd individual stage win of the 2004 Tour today. Thomas Voeckler finished with a 46:something. Vladimir Karpets will take a big chunk out of the white jersey. Azevedo has set the top time at the 2nd time check with a 24:40, but now Jan Ullrich comes through even faster, a 24:07; Basso rode a 24:43 to the checkpoint, and Armstrong demolishes all their times with a 23:28 to the checkpoint! Sheryl Crow is in the US Postal pace car. Take that, Robin Williams! Lance Armstrong showed his Tour de France preparation is right on schedule with a mountaintop win in Sunday's final stage of the Tour du Languedoc-Roussillon. 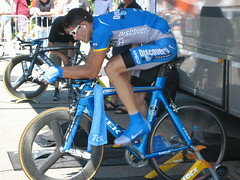 Christophe Moreau of Credit Agricole won the overall, 46 seconds ahead of US Postal's Viatcheslav Ekimov. "At this time of the year, I know where my fitness level should be -- I think I'm there," said Armstrong, confirming that he will race the June 6-13 Dauphine-Libere, his last major racing test before the Tour de France kicks off in Liege, Belgium on July 3.